TALLAHASSEE, Fla. — 72 years ago today, Jackie Robinson made history and forever changed Major League Baseball by becoming the first black man to play in the league. Robinson's achievements are being remembered on what has come to be known as Jackie Robinson Day. The Village Square is screening the movie "42" about Robinson's life. After the screening, they'll open the floor up to talk about diversity and race relations today. 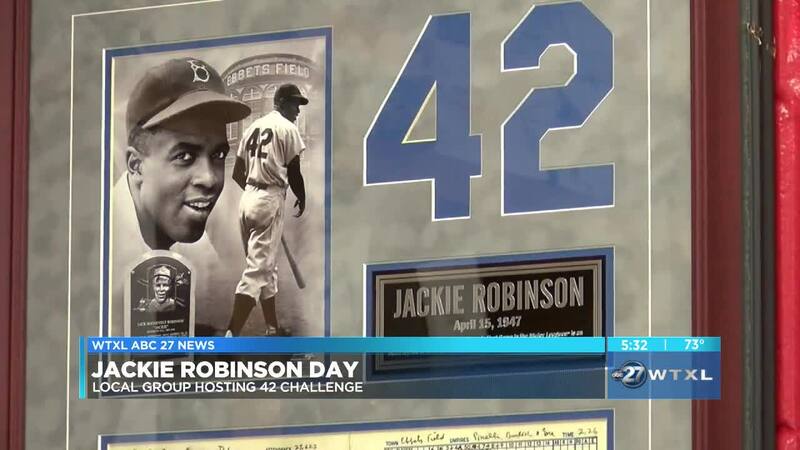 Village Square has been celebrating Jackie Robinson all year long. The group started the 42 Challenge on Robinson's 100th birthday back in January. The scavenger hunt identifies Robinson's connections to civil rights right here in the Capitol City. Five clues lead you to the bases around town, teaching people about Robinson's connection to the Tallahassee Bus Boycott, integration at FSU, and a famed sportscaster. "He had to quietly let his play on the field do the talking for him," said Bill Mattox, The Village Square Board Chairman. "And I think that's a model for all of us to be careful not to respond to insult with insult or to allow people who offend us to get the better of us but instead seek to find ways that will overcome injustices or mistreatment that we may face to lead to better outcomes for everyone." Robinson was born in Cairo, Georgia and to this day, some of his family is still in Grady County. His childhood home is now a historical site, there's a baseball field named after him, and there are roads honoring the legendary baseball player. If you would like to come out to the movie screening and discussion Monday night, it's all happening at the All Saints Cinema on Railroad Avenue at 7:00 p.m.